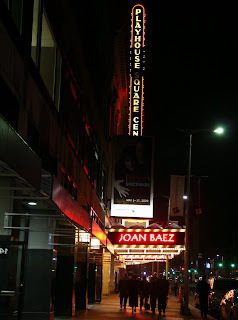 last night's joan baez concert was FANTASTIC! it is hard to believe that baez is 68 years old, her voice is still clear and pure; physically she is fit, trim and radiant. if I could look half that good now, let alone when I'm sixty-eight I would be happy. but maybe 68 is the new 38? joan was accompanied by four musicians including, on percussion, her son gabriel harris. the playlist included songs from all stages of joan's long career. although joan is a singer-songwriter, she is best known for her interpretations of other people's songs. last night there were a few songs she wrote, but most of the songs were covers of songs written by others. there were at least three songs from her new album day after tomorrow - god is god (written by steve earle) rose of sharon (by eliza gilkyson), and scarlet tide (by elvis costello and joseph henry). I was too busy enjoying the concert to write down the playlist. however, I can recall many of the songs she played, along with the three mentioned above, joan sang: the night they drove old dixie down; sweet sir galahad (which is a song joan wrote for her late sister mimi after the tragic death of mimi's husband on mimi's 21st birthday); joe hill (which she claimed wasn't on her original playlist but was including since we were such a special audience); love is just a four-letter word; diamonds and rust; farewell angelina; try and catch the wind; christmas in washington (which I prefer to think of as come back woody guthrie)....and many more. when the group came back for an encore, they performed two more songs closing the night down with lennon's classic imagine complete with audience participation. this of course made my day - I love a concert where the performer welcomes us to sing along! there were plenty of poignant and humorous moments especially when joan shared stories. she included a few family stories including a sweet yarn about her parents remarrying when her father was ninety-one. he claimed he didn't want to die unmarried and he asked her mom to marry him because he couldn't imagine being married to anyone else. from joan's story it sounds as if her dad preferred comfy to fancy clothes, but joan was successful guilt-tripping her dad into wearing a tuxedo. he died three years after he got married this second time to joan's mother. joan's mother is still alive; I think joan said her mom is 95. according to wiki, the portal of all knowledge, joan's mom lives in california with joan. based on joan's mother tales, big joan (as some refer to her) sounds like a real live-wire and age has not dampened her love of life (and men). maybe 95 is the new 59! coincidentally today is the birthday of joan's late brother-in-law , richard fariña (b. 8 march 1937-d. 30 april 1966), who is also one of the subjects of david dajdu's book positively 4th street: the lives and times of joan baez, bob dylan, mimi baez farina & richard farina. I dedicate today's post to mimi baez fariña who died in 2001 at 56 - way too young. in 1974, mimi founded bread and roses, a non-profit organization, designed to bring free music and entertainment to hospitals, nursing homes, and prisons, initially in the bay area it is now a national organization. bless you mimi! "Bread & Roses" is a fantastic organization-- thanks for publicizing it! Nice write-up of the concert, too. Saw one B & R concert in Berkeley = Joan Baez, Mimi, Dave Van Ronk, Mickey Newbury and some others. Saw Newbury 3 more times and met him once backstage at the Boarding House in SF with my friend David. Dylans got a new album coming out next month I've read and it's suppose to be killer. He seems to be on a roll. 68 the new 38, huh? So...I'm only 32? Thanks, this is good news, I'll start recycling my old photos. Bread and Roses - many fond memories at this end, both of the song and the organization. My wish on International Woman's Day? Bread and Roses as a matter of course for everybody. Well, I guess you had a good time. Heh, heh! And the song almost got me marching again, except that I just sat down after a long hike and I don't think I can get up just yet. Love love love Joan Baez. Her voice is amazing and I had no idea she's 68 now. Saw her on a biography about Dylan not long ago and she looked wonderful. I love her Dylan album "Any Day Now". That sounds like a great show! Catch The Wind must have been wonderful. I'm pretty sure that the song during which she imitates Dylan is Farewell Anglina, but I'm having trouble finding it like that on youtube. Gabriel wasn't with her in Seattle -- she had a three-piece string band. She's still amazing. coffee - what a great line up. I wait with bated breath - wow, he is on a roll, seems like I just got a new dylan album, but I can never have too many. rlb - what a wonderful wish for the world!! tbh - thanks for dropping by the mouse and nibbling a bit and the lovely comment. hey, drop me an email when you find the dylan impersonation, if anyone can find it you will. Is anthem the right word to describe Bread and Roses? I love the blending of their voices. Glad you loved the concert, how could you not? Wow! I had no idea she was still touring...used to spend hours listening to her albums, trying to sing her high notes...Sounds like it was a blast! Great review! It makes me happy to think of you there taking it all in. It's just so RIGHT for you. Joan is 68?? Wow. Where did the years go? I am so happy that you had a wonderful evening with Joan. She didn't share the story of her father with us but we did get a huge support for Obama with cheers from the crowd. About age..so subjective in a way. My initial thought was wow, 68, until I read her mom was 95 and suddenly 68 (or 45) seems a mere tot. Nice to think I have some time left to enjoy the blessings of this life. Ah, Joan! Saw her in a concert with Gabriel a few years back, incredible. And she has been a favorite of mine ever since...well, we're both 68 and I started collecting her vinyls back when we were hanging out in coffeehouses and listening to this new music - folk. I didn't realize Mimi Farina had died. Sad. Thanks for the wonderfully cheezy follow-up Mouse. Baez is rich, delicious and definitely not ready for a walker. Sounds like a fantastic concert and glad you enjoyed it so much. that's funny--i just saw a documentary about Dylan and Baez on tour in England--great you got to see her live! Joan is still so vibrant and vital. I remember when I saw her in "No Direction Home", it was a bit of a surprise to see that she has such a sense of humor too. We tend to think of her as earnest, but it's easy to overlook that she can be so joyful and was and still is such a beauty. Wonderful post on Joan Baez. It quite takes me back. I was a first year art student in 1969 and my music was Dylan and Baez and Joni Mitchell (umm.. yeah, and a bunch of hard rock and roll, too). I never got to see Dylan or Baez in person so I thank you for this vicarious concert. I'm so glad the concert was such a great success! I've seen JB live four times and she never disappoints. That's an interesting set list -- a bit different from the one she performed when Gary and I saw her, I think. I read David Hajdu's book and it's fascinating. I could never get into the Farinas' music, though -- I bought two of their albums and never quite warmed up to them. Love JB! I have only seen her in concert once, but she is RADIANT!